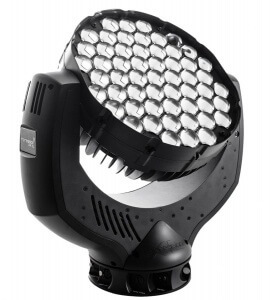 The GLP impression X4 XL uses an incredible array of 55 RGBW high output LED’s, each rated at 15 watts, coupled with a highly efficient zoom range from a tight 7° degrees to a wide 50° degrees. The X4 XL produces a massive amount of light that will throw for extremely long distances. The optical system, originally designed for the GLP impression X4, gives a sharply defined beam complete with hard edge in the lower zoom range whilst remaining absolutely homogeneous and soft edged at wider angles. This is all contained within the stylish baseless design that has become synonymous with the GLP impression series. The output is a full RGBW color system with additional variable color temperature correction control for added flexibility when working with whites. Also featured are an electronic strobe with variable speed, smooth full range dimming – with no color shift – and 16 bit pan and tilt movement, with feedback control. The impression X4 XL features individually controllable LED’s allowing a range of different patterns to be created and displayed on the front lenses, including arrows, numbers, letters and much more, either from stock patterns or through user created patterns.